Solardome Industries, Southampton, UK, is delighted to announce the team behind the RHS Chelsea Flower Show, ‘The Secret Garden of Past & Present’ have won a prestigious gold medal in the Great Pavilion Awards 2013. Created by Lynn Riches and Mark Lippiatt of Horticolous Landscape and Garden Design to mark Chelsea’s centenary year, the garden represents a culmination of time and expertise of all involved – Solardome Industries, Paignton Zoo, Suttons Seeds, HydroGarden and Foras Stone. 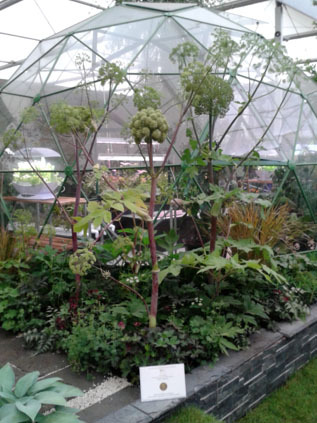 The new green SOLARDOME® Haven model was selected as the stunning centrepiece to the modern segment of the garden due to its innovative geodesic design, demonstrating the latest technological advances in modern growing techniques. It housed the latest products in hydroponics and aquaponics and plants cultivated using vertical growing. A Solardome® glasshouse is an ideal environment in which vegetables grow healthy and strong, exotic plants flourish and citrus fruits thrive. Superior air distribution and airflow help maintain a more uniform temperature and keep it fungus and disease free. Plus, maximum solar gain is achieved as a result of 97% light transmission to the multiple facets of the geodesic dome, resulting in extending the growing period and better plants for your garden.